Confined Space - F.A.S.T. 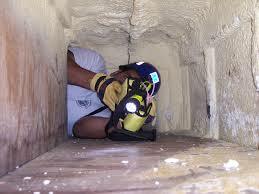 Rescue Inc.
A number of workers are injured or killed each year while working in tight places. An estimated 60% of the fatalities each year have been among the “would-be” rescuers. Some examples of confined spaces include silos, vats, hoppers, utility vaults, tanks, sewers, pipes, truck or rail tank cars, aircraft wings etc. Confined space certification will assist in fulfilling a company’s obligation to ensure workers are trained and competent to deal with confined space entry, at the same time reducing the risk of accidents.